For one of my objects, I chose a piece of World War I sheet music called "Feenish." I became interested in the piece first because it was published in France, oddly, not the U.S. It turns out that the song was written by two American soldiers while they were in France, and my best guess is that the famous French publisher Francis Salabert liked the piece so much that he made his own arrangement and published it. And I can understand why Salabert took a liking to the song—it is written from the point of view of an American soldier in France, who is having a hard time understanding French. The solider keeps hearing one word over and over, and thinks it's French: "feenish." However, the word is just French people saying "finish" in a French accent—as in "finish the war, and then we'll see about helping you out." There's little bits of French strewn throughout the lyrics, too. Notice that the last word of the 2nd verse is missing. On purpose. 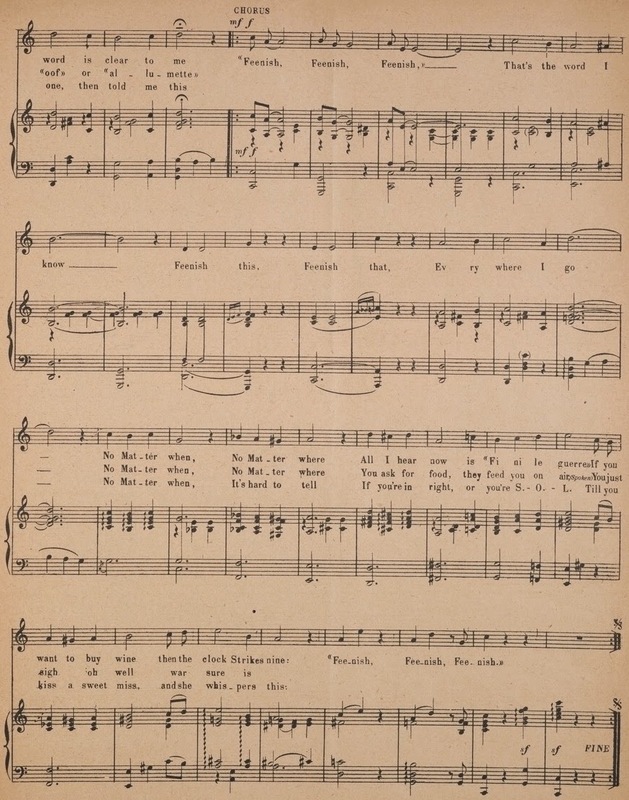 The music of "Feenish" is typical of popular music from the era, with perhaps slightly more chromatic chord progressions influenced by early jazz. The choice of a slow waltz tempo may have been a nod to European musical tastes. The vocal line certainly flowed nicely, building up to the phrase "fini le guerre", the crux of the song and the point at which the joke is revealed, if the audience hadn't guessed it before then. The soldier who wrote the music, Albert C. Mitchell, also has an interesting story. He served the war as a military bandsman, and wrote other popular World War I tunes such as "The Dixie Division" and "Over the Top (with the Best of Luck)." Then after the war, he went on to play saxophone with Paul Whiteman's orchestra. But as I was doing the authority work for Mitchell, or in other words determining which of the many Albert Mitchells was the author of each work, I also discovered that in the 1940s this Albert Carlyle Mitchell from St. Louis had a second career, which had nothing to do with music—he became a host of a radio show called The Answer Man, in which people wrote in questions about anything and he seemed to answer them on the fly. In actuality, he had a staff of forty people and they broadcast across the street from the New York Public library; so in many, ways he was a radio librarian. I hope you enjoy Feenish. 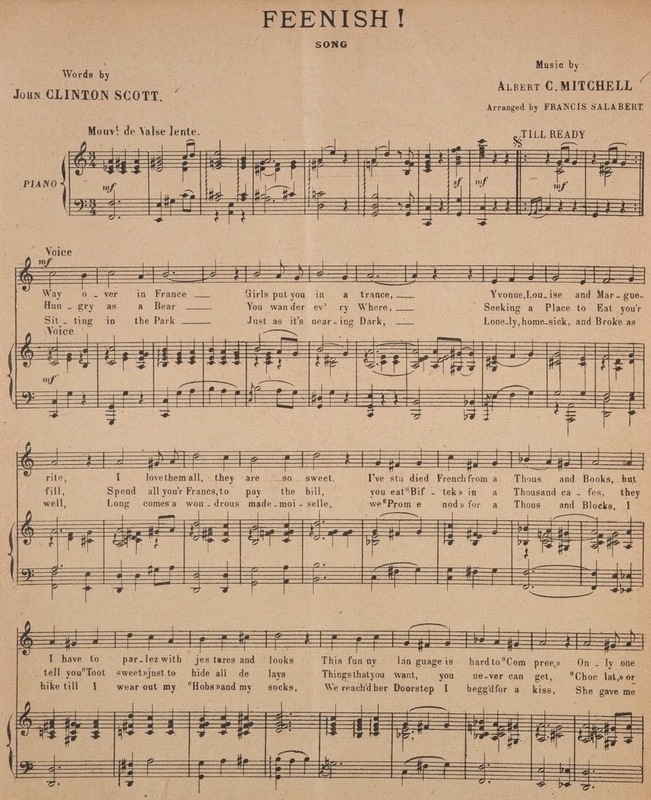 Hopefully, the rest of the 14,000 pieces of World War I sheet music the the Library of Congress digitized will be up soon and you can enjoy some more of them. * I was pretty hoarse by the end of the day. One of the most interesting tools the Library of Congress has for audio preservation is IRENE (Image, Reconstruct, Erase Noise, Etc), a tool that basically takes a visual picture of the sound groove in an analog audio disc, such as a vinyl or lacquer record, and then reproduces the sound from the picture without ever having to touch the disc with a needle. IRENE can do this imaging and analysis almost in real time. IRENE has also been developed for the 3D imaging of wax cylinders (whose sound information was stored vertically instead of laterally), though it is much slower—it takes 80 hours of imaging to get 2-4 minutes of audio. However, since wax cylinders are so fragile that even a couple of playings can damage them, this type of non-invasive extraction is very important. You can read more about IRENE here. This method of capturing sound recording is of course time-consuming and expensive, but what other choice do we have if we want to preserve the past for future generations? Now if only the Library of Congress had more time and money, they might be able to save more of the nation's national sound and visual treasures. But at least they will do what they can. Meanwhile, a toast! This is SSF's 100th post. Sorry it's not quite as exciting as this 100th. P.S. If you are interested in the preservation of video games, which is arguably much more difficult than even audio/visual, you should watch this. Sometimes things just don't line up. From Wikimedia Commons. I recently gave a presentation about the music and audiovisual librarianship and I've decided to share part of my presentation here. This slightly edited section is about how the advent of electronic mediums complicates music and audiovisual librarianship. How much does the preservation of physical media matter if "everything is going online"? You can check out e-books and now even e-movies from libraries, Netflix is moving away from physical DVDs and concentrating on streaming services, and who buys physical copies of albums anymore? Physical media: dead or dying? My answer to such questions is that physical media may be declining, but it is not yet dying, especially in academic libraries. Electronic scores have yet to be standardized, and even academic e-books are scarce, especially in the humanities. And some physical media is on the upswing, for example the (modest) resurgence of interest in vinyl recordings. And physical storage remains the best way to preserve and lend materials. Digital storage, although often the best way to preserve old media (or as the Library of Congress calls anything produced in the 20th century, "New Media"), digital storage takes a lot and care and feeding to keep the data from becoming lost or unreadable. Personally, I still buy physical copies of CDs, because I like the added value of art and liner notes and as a backup for digital files. I value the added information. At the same time, though, for space and financial reasons I often don’t purchase movies that 1) I’m not going to watch more than once a year, and 2) are readily available on Netflix or another streaming service, or the library. I, however, am not an institution that needs to plan for preserving the collected media of the generations. One of the most troubling problems of the digital revolution is release of e-only music and movies and restricting licenses that accompany them. This deployment of e-media means that libraries often cannot even own it, much less preserve it or lend it. A recent court case ruled that in order for someone to resell mp3s, they had to sell the actually hard drive on which they were downloaded. This is frankly ridiculous. First Sale, the legal idea that makes libraries possible, has not been well clarified for digital material. This e-material debate is not over and needs to be addressed in the law. We’ve seen from past experience that publishing companies have little or no incentive to store and catalog their own recordings or music. For example, Capitol records was going to throw away their archive from the 1950s and 60s, including original Frank Sinatra and Nat King Cole recordings and manuscripts, and would have done so if Brigham Young University's library had not spoken up and claimed the collection. However, streaming is not going away, either. Sometimes, especially for small libraries, subscriptions to Naxos and Alexander Street Press are an easy way to get a lot of content. I’m sure a similar model of movie databases marketed to academic libraries will happen soon, but who knows how much it will cost? These streaming databased don’t have everything users need, either, and their catalog can change at the drop of a hat. And streaming does not solve the space issue. We may be able to move items available through streaming to offsite storage, or adjust acquisitions models so we don’t buy them, but with the flood of items produced each year, there will be plenty of resources to take their places. What does this mean for libraries? First, digital objects need care and feeding just like physical objects. Second, and more troubling, librarians need to plan for an digital electronic future but shouldn't abandon the physical objects. As time consuming as it sounds, we need to function in an online resource world as well as a physical resource world, shouldering the new forms while keeping up with the old. I hope these extra responsibilities comes with greater pay, but I'm not holding my breath. Do you physical media is going to become obsolete? The first group I saw was a Chinese marionette troupe, the Quanzhou Puppet Troupe. These puppeteers did some amazing feats, such making a marionette do tricks while riding a bicycle. I think one of the most amazing things about the group, however, was that it had a seven-piece Chinese orchestra, which you can see in the above picture: three percussionists and four other players that switched between melody instruments. There were almost as many musicians as their were puppeteers, which I think says something about the importance of music to their tradition. The instrument you can see best in this picture is the pipa, a four-stringed lute. The four melodic players pretty much played the melody without harmony the whole time, but varied who was playing and adding their own ornamentation particular to their instruments. This type of musical texture (many instruments playing one melodic line) is sometimes called heterophony. If you look closely at the marionettes in the picture above, you'll see that they are playing instruments, too—and the puppeteers were very good about playing when their corresponding instrument was playing. The next group I saw was Ih Tsetsn, a Beijing-based group of Inner Mongolian musicians (Inner Mongolia, by the way, is part of China while Outer Mongolia is what we call the country of Mongolia). This group was made up of three horse-head fiddlers, a percussionist, and three guitar-like strumming folk instruments. All of them also sang. And not just your normal singing—they were throat singing, which is a style of singing that allows men to produce more than one note. For example, you might hear a high, clear whistling sound from this group, and you might look around for some sort of flute, but then you realize the man in blue on your left is actually making the sound with his throat (along with another note). The high whistling sound is actually an overtone, or a vibration already present in the vocal sound at a different frequency from the normally-heard fundamental note. The singer is able to bring forward that note so it sounds out from the fundamental. Besides singing more than one note, Ih Tsetsn were great instrumentalists, too, using their horse-head fiddles to sound like actual horses and sometimes mixing in some samba beats into their staple horse-trotting-influenced rhythms. They weren't sticklers to tradition, but didn't abandon it, either. The Leishan Miao Dance and Music group, representing an ethnic group that lives in the southern Chinese mountains, played and danced at the same time with their lusheng (a type of mouth-organ), an instrument that has a very distinctive sound. I obviously spent more time in the Chinese tent then the Kenyan one, and that's because the Chinese music was more different than American music. This was true at least about all the Kenyan groups I saw. The bands were very much guitars and percussion with a lead vocalist, with music built around dance grooves (and had accompanying mosh pits, as you can see). Of course the style differed some and there were as many percussionists as guitars, but nothing really surprising or different or amazing. It's a shame more people can't visit the festival, as it can be a very eye-opening event. Hopefully, I'll be able to attend another one myself in some future year.